TheBlueGuerilla: Labour in Spy Row Over RoadTrip2015. 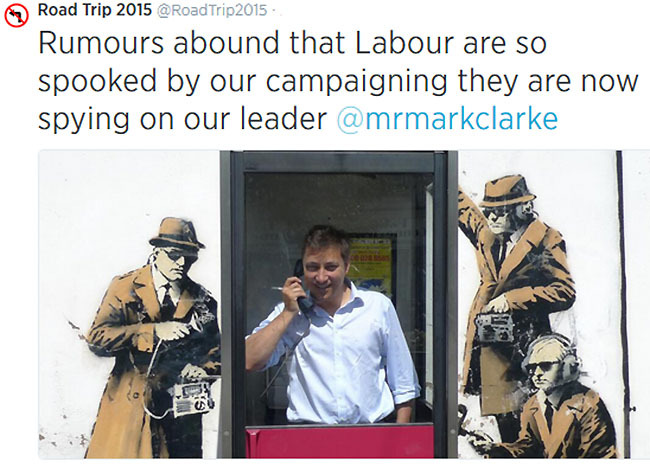 There's a rumour doing the rounds that the Leader of Grant Shapps Road Trip 2015, Mark Clarke, has been spied on by Labour. Rumour has it that Labour are deeply concerned after the Tory ground-war success in Newark. And with 100+ supporters now registered for the Great Yarmouth Trip TBG can also reveal that when Labour held their own target work in the Norfolk seaside town on Saturday only twenty people eventually turned up and originally there was just eight. The news comes on the day that spread bookmakers say that they still believe, albeit based on weight of money, that Labour will win the most seats at the General Election next year but not enough to form an outright majority. Mark Clarke fell short of being elected himself in 2010, losing to Labour's Sadiq Khan. The news also comes on the same day that part of Labour's economic plan was leaked to the Mail on Sunday and CF'rs including East of England Chair Stephen Canning went to the seaside in Clacton.